Choose personal stereos with an automatic volume limiter. By directing sound into your ear, headphones can produce levels loud enough to damage your hearing. Hold your headset an arm's length away. If you can hear the sound, the volume is probably too high. Noise can be damaging if you have to raise your voice to be heard by someone an arm's length away. Wear earplugs or earmuffs when you're around noisy tools, equipment or firearms. Use commercially made devices that meet federal standards. Make sure the protectors fit snugly. Don't use cotton earplugs. They're ineffective and can become lodged in your ear canal. If you're frequently around loud noise, have your hearing checked annually. 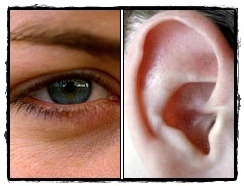 A hearing test can detect mild hearing loss before the damage is obvious or disabling.